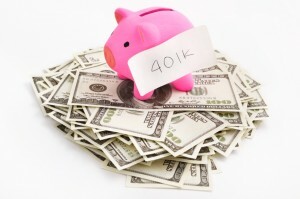 Can I Borrow From My 401K to Buy a Home? There are a couple different ways to utilize your retirement account for a down payment when buying a home. The first would be to liquidate the account. This is not the option chosen the majority of the time because of the heavy penalties incurred for liquidating the account before a person reaches the age of 59½ years. The more commonly chosen method for using a 401K or 403B for a down-payment would be to borrow from the account. Borrowing from the retirement account will allow for a person to liquidate the necessary money from his/her account and use that money for a down payment on a home. The amount borrowed would then be paid back to the retirement account on a set schedule of typically 5 years or less. However, in many cases, if the amount borrowed was used solely for the purchase of a home, the pay-back period can be adjusted to go past that 5 year point. The payments will be made back into the account usually by automatically deducting the amount from a person’s paychecks. This can be a great way for a prospective home buyer to realize their dream of owning a home and not incur the heavy penalties of cashing out their 401K or 403B account in order to do so. If a person were considering borrowing from or cashing out their retirement account, the first step should always be to get the documentation/information from their Human Resources Department. This paperwork will clearly define the particulars of their specific situation. Once the documentation is in hand, it is best to meet with a mortgage professional to go over how the funds will be utilized to accomplish a down payment on the home. There are many moving parts of purchasing a home in today’s financial and economic climate. If you are considering buying your first home and need a down payment, but don’t have a retirement account to borrow from, a down payment assistance program may also be an option. If you would like to learn more about borrowing from your retirement account, or utilizing a down payment assistance program offered by the state, go to our Calendar/Reservations page and register for one of our FREE First Time Home Buyer workshops.